One of the Lower East Side's classic buildings, the Jarmulowsky Bank Builidng was built by architects Rouse & Goldstone in the "Modern Renaissance Style." It was completed in 1912 and was designated a New York City Landmark by the Landmarks Preservation Commission in 2009. The bank was established in 1873 by Sender Jarmulowsky, a Russian Jewish immigrant who went on to become one of the Lower East Side's most prominent businessmen....and was also a Talmudic scholar. He was also one of the Lower East Side's most prominent philanthropists and served as the first president of the Eldridge Street Synagogue. Jarmulowsky's Bank was a well known institution among Yiddish speaking Jewish immigrants on the Lower East Side....and their relatives still living in Europe. Immigrants here in New York City used the bank to send money to their relatives abroad....and to purchase steerage tickets (in Yiddish) so their relatives in Europe could also emigrate to the USA. World War I broke out two years after this bulding was completed and the bank failed after a bank run as depositers withdrew funds to send to relatives abroad. 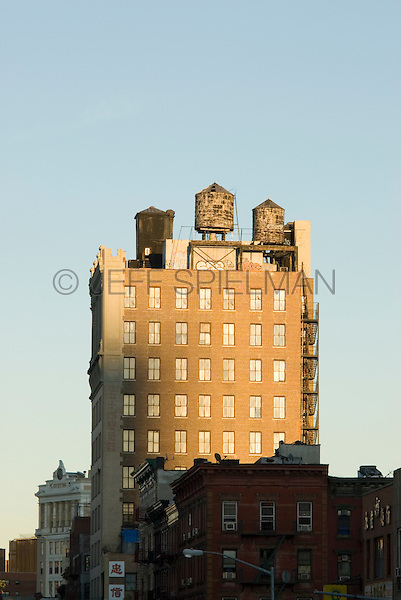 The building was once the tallest building on Manhattan's Lower East Side. According to a Yiddish newspaper of the time, Sender Jarmulowsky was " living proof that in America one can be a rich businessman but also a true, pious Jew. ".